Those that are starting out wanting to learn to ride a motorcycle will need to know which type of licence they are entitled to. Covered within this section are the various motorcycle licence categories along with the type of vehicle that is covered within that category, age requirements and what is required in order to gain a full riding licence within that category. 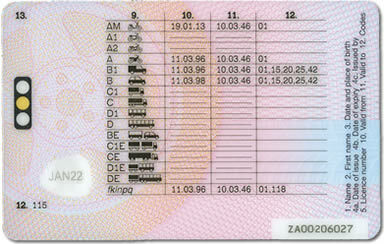 Detailed below are motorcycle licence categories along with the type of vehicles covered within that licence category. Please note, riding licence category ‘P’ was previously used for mopeds and is now category ‘AM’. and a speed to not exceed 45 km/h (28 mph). AM Small 3-wheeler up to 50 cc and below 4 kW. AM Light quad cycles weighing no more than 350 kg with a maximum top speed 45 km/h). A1 Light motorcycle without a sidecar. Maximum of 11 kW (14.6 bhp) with a power-to-weight ratio no more than 0.1 kW per kg. Minimum of 120 cc and to not exceed 125 cc. Must be capable of reaching a top speed of 90 km/h (55 mph). A1 Motor tricycles that have a power output to not exceed 15 kW. A2 Standard motorcycle without a sidecar of between 20 kW (26.8 bhp) and 35 kW (46.6 bhp), with a cubic capacity of at least 395 cc (and a power-to-weight ratio not more than 0.2 kW per kg), motorcycle must not be derived from vehicle more than double its power. A Unrestricted motorcycles in size/power, with or without a sidecar. Motorcycle must have a cubic capacity of at least 595 cc and an engine power of at least 40 kW (53.6 bhp). Detailed below explains the motorcycle categories, minimum age required for that category and the requirements necessary to meet to gain a full motorcycle licence within that category. 16 CBT, theory and practical riding tests. A1 17 CBT, theory and practical riding tests. Must have held and A1 licence for a minimum of 2 years and to take a practical test. Requirements are to hold a valid CBT and theory test certificate and to take a practical riding test. Must have held and A2 licence for a minimum of 2 years and to take a practical test. You can apply for your provisional motorcycling licence here. Once you have your licence, you’ll need to then complete compulsory basic training (CBT). CBT isn’t a test, it’s training, therefore you cannot fail. After you have completed CBT, you’ll be a learner rider and you can ride a moped at 16 years of age (specifics detailed above) or a motorcycle at 17 years of age (specifics detailed above) and over and display L-plates on the front and rear. You can then legally ride on a public road with a motorcycle or moped that your licence entitles you to ride. You will of course need to tax and insure your vehicle and have a valid MOT certificate if applicable. The next stage is to book and pass the theory test for motorcycles. See motorcycle theory test explained for further information. Once you have passed your theory test, you can begin the process of gaining a full motorcycle licence. You’ll first need to pass the module 1 test, followed by the module 2 test to gain a full licence. As explained in the tables above, after you have passed module 2, you may still be restricted on which motorcycles (in terms of power) you are entitled to ride due to your age. If the motorcycle you take your test on is an automatic, you’ll only be licensed to ride an automatic motorcycle. Pass your test on a manual and you can legally ride both manual and automatic.